Friends and long-time readers of this blog know I love 3D images, and have even dabbled in making them myself. 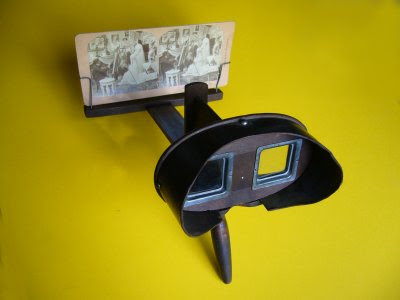 I've also got a small collection of antique stereographs: pairs of photos printed on thick curved cardboard that are viewed through a stereoscope to show a 3D picture. They were early View-Masters. At the turn of the 20th Century, most well-appointed parlors were equipped with a viewer and a cabinet full of 3D cards to entertain guests, bringing the exotic wonders of the world to people who'd never see them otherwise. I especially like stereographs of places I've been. It's fun (and a little spooky) to compare my modern experience of a place to that of someone a century ago. 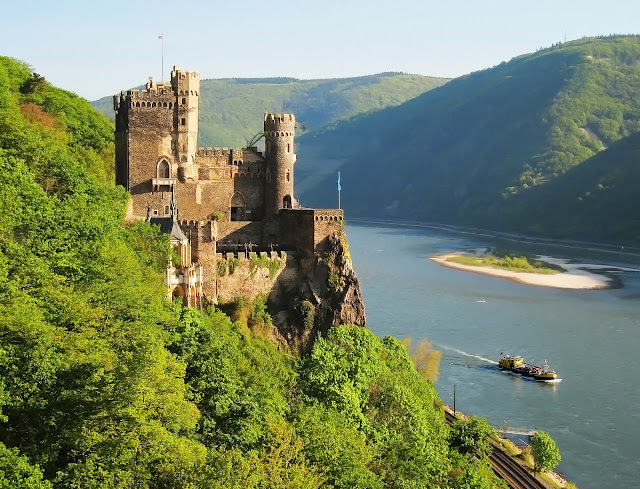 At an antiques fair yesterday, I found a card of Rheinstein Castle; since Karen and I just took a cruise up the Rhine River, I had to bring the card home and check whether we'd seen that castle ourselves. 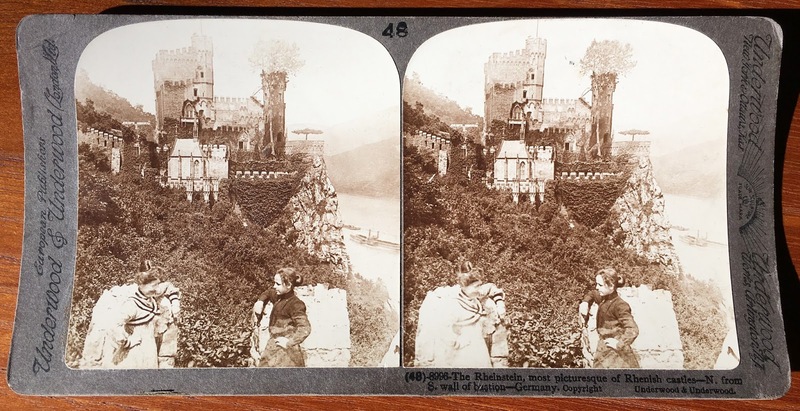 Here's the stereograph. The back of the card provides a little history of the castle, which Wikipedia expands upon. The card doesn't have a copyright date, but most of them were made in the late 19th Century. The fad died out in the 1910s, probably related to the coming of silent films. 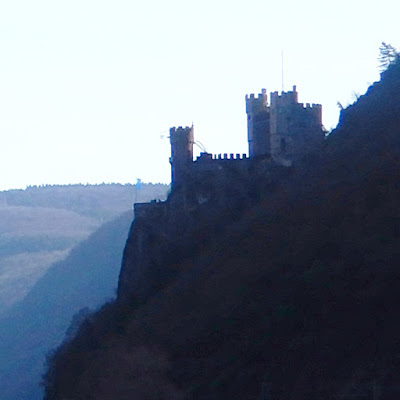 Here's a modern photo of Rheinstein Castle taken from nearly the same vantage point. Some features are different, others are the same. It's interesting that the perilous-looking steps with curved railing that lead to the right-most tower look like they haven't changed in a century. There, that hulking silhouette on the right bank. It's distant and dark, and unfortunately the only picture of this castle I got. Cropping and fiddling in Photoshop brings out a few more details that make it a definite match. 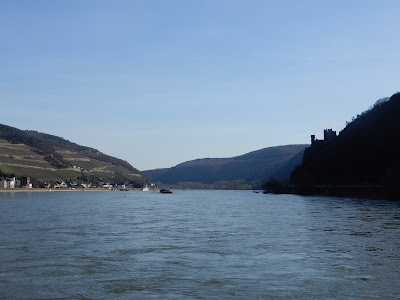 A century after Rheinstein Castle was visited by those two women lounging on a neighboring battlement, I was there too. Travel's good for making these connections with history--not just the centuries of history represented by the castle, but the century of tourism connecting those women to me. C'mon, that's cool! I enjoyed rereading Mark Twain’s Innocents Abroad and Roughing It to compare his descriptions with what I saw visiting the same sights (or sites, both seem to apply), over a century later.